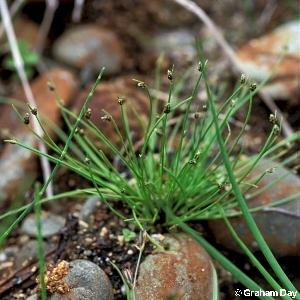 A small native species of wet ground, similar to the slender club-rush (Isolepis cernua) but with a bristle-like projection of what appears to be the stem (but which is actually a bract) beyond the tiny flower spike; common and widespread across the whole of Northern Ireland. All names: Isolepis setacea (L.) R.Br. ; Scirpus setacea L.; Scirpus setaceus L.